For the first time ever, there's a new Dynamic Variable Resistance leg extension machine that recognizes the full complexity of the knee. For the first time ever, there's a new Dynamic Variable Resistance leg extension machine that recognizes the full complexity of the knee. It's Universal's scientifically researched, biomechanically engineered Centurion II /DVR Leg Extension Machine, developed to build stronger, more functional leg performance than ever before - thereby reducing the likelihood of knee injury. 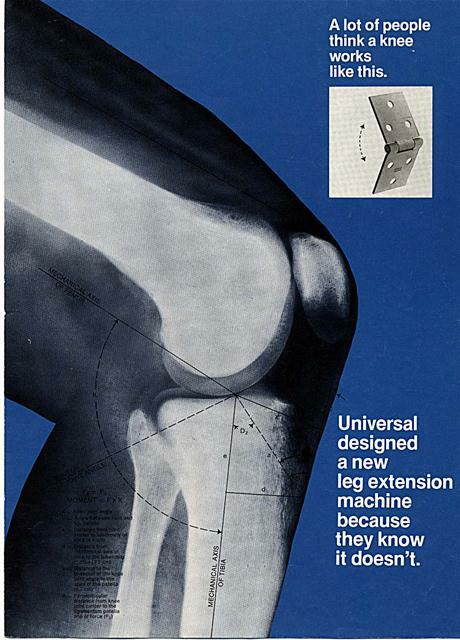 computer data processing, and dynamic assessment of the knee joint itself. The result of Dr. Ariel's study was a resistive formula capable of maximizing muscular development around the knee in each and every phase of the movement, while undergoing natural explosive movements. Without application of this formula maximum muscular development is reduced to limited phases of the movement. Ultimately this hinders performance and may increase the vulnerability to traumatic injury. 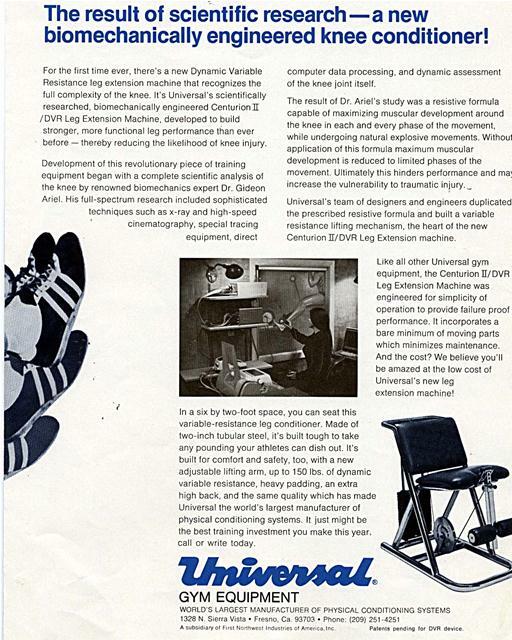 Universal's team of designers and engineers duplicated the prescribed resistive formula and built a variable resistance lifting mechanism, the heart of the new Centurion II/DVR Leg Extension machine. f -7	Like all other Universal gym equipment, the Centurion II/DVR Leg Extension Machine was engineered for simplicity of operation to provide failure proof performance. It incorporates a bare minimum of moving parts which minimizes maintenance. And the cost? 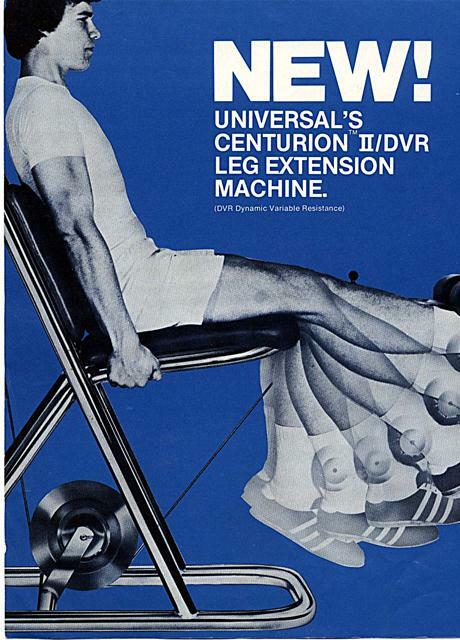 We believe you'll be amazed at the low cost of Universal's new leg extension machine! In a six by two-foot space, you can seat this variable-resistance leg conditioner. Made of two-inch tubular steel, it's built tough to take any pounding your athletes can dish out. It's built for comfort and safety, too, with a new adjustable lifting arm, up to 150 lbs. of dynamic variable resistance, heavy padding, an extra high back, and the same quality which has made Universal the world's largest manufacturer of physical conditioning systems. It just might be the best training investment you make this year. call or write today. Deluxe Double Twister with a standing and seated position that can be used at the same time. Heavily Padded Incline and Decline Benches. Rugged. Thickly Padded Flat Exercise Bench..
A subsidiary of First Northwest Industries of America,inc. U.S. 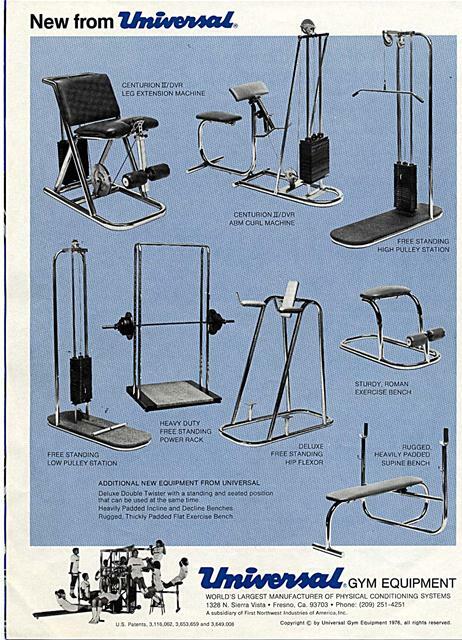 Patents, 3,116,062, 3,653,659 and 3,649,008	Copyright ,cï¿½ by Universal Gym Equipment 1976, all rights reserved. Generated on 4/24/2019 8:49:56 AM (PST) ADI/HQ/GBA/2019/ARIELCLOUD/v3.0.2018.0126.